Travel brochure "P-O Midi," 1935. Published by the Paris-Orléans and Midi Railways." Front cover. 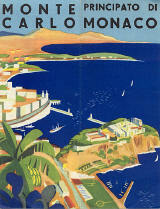 Travel brochure "Monte Carlo - Principato di Monaco," circa 1933. Travel brochure "The Riviera," 1930. Published by "American Express." Travel brochure "Biarritz," circa 1935. Published by "Maison du Tourisme, Biarritz." Travel brochure "P-O Midi," 1935. Published by the Paris-Orléans and Midi Railways." Back cover. Travel brochure "Une Visite à Paris et à l'Exposition Coloniale," 1931. Published by "le Chocolat-Menier." Travel brochure "Visitez l'Exposition Coloniale de Paris, Mai à Novembre 1931 - Plan de l'Exposition." Published by "le Chocolat-Menier." Travel brochure "L'Hiver à la Côte d'Azur," circa 1927. Published by "Services Automobiles P.L.M." Signed "Guillamme Roger."